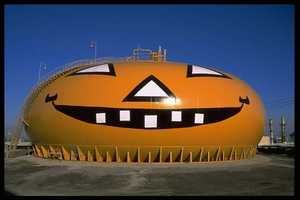 WILMINGTON, CA -- (MARKET WIRE) -- October 14, 2005 -- ConocoPhillips (NYSE: COP) continues a 53-year tradition by transforming a pumpkin-shaped 3 million gallon storage tank at its Wilmington, California-based Los Angeles refinery into Smilin' Jack, the world's largest jack-o-lantern. The refinery pumpkin patch expects at least 30,000 visitors who want a close-up look at Smilin' Jack. Since 1952, visiting the great pumpkin has remained a popular Halloween event in Los Angeles' South Bay area. ConocoPhillips extends an invitation to the community to see Smilin' Jack and enjoy some of his delicious caramel corn on the nights of October 30 and October 31, from 6 to 9 p.m. The ConocoPhillips refinery is located at 1660 West Anaheim Street, Wilmington, CA 90744, between the Harbor Freeway and Gaffey Street. Preparing Smilin' Jack for his annual appearance requires more than 100 gallons of orange, black and white paint. According to refinery engineers, if the giant jack-o-lantern were filled with pumpkin meat, there would be enough to make 26,800,000 pumpkin pies! ConocoPhillips is an integrated petroleum company with interests around the world. For more information, go to www.conocophillips.com. opportunities, live radio broadcasts, etc. --  The world's largest jack-o-lantern. --  Illuminated at night and visible for miles. a jack-o-lantern painted on two sides. are expected during the two-night event!